Today is dominated by Venus aspects and a number of higher order outer planet aspects. Most noteworthy is Venus semisquare Pluto, a source of a sense of urgency or annoyance that inspires us to action. We tend to feel this more later in the day rather than earlier. 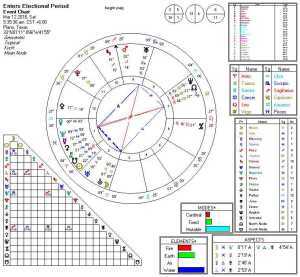 Venus is also quadrinovile the North Node (“Karma”), and we may learn a skill or have an insight that is quite useful at some point in the future. Pay attention! Jupiter opposes Ceres and “something” goes wrong considering our prosperity or at least some critical issue involving food. This is a Virgo / Pisces aspect, and it may bring to the surface certain issues related to the recent eclipse. Since this has been building for a few weeks (or even a few months), this could actually happen any time between the a week before the perfection of this aspect or up to the week after. We might add that chances are good it came to our attention on the day of the eclipse. But, whatever it is, you will likely feel it. Jupiter is quincunx Pallas, and some ideas that may seem good at the time will prove to be not so strong later. Chiron (health, education, mentoring, “healing thyself”) is also quincunx Astraea (law and legal system). All around, it tends to be a day of annoyances that contains some well hidden but important learning opportunities. With the entry of Venus into Pisces, we enter a powerful new period in which creative ideas abound and can trump the status quo. This Mystic Rectangle precedes the patterns of next week. We note that Monday March 14th is a truly remarkable day in terms of patterns. Expect nothing short of amazing events next week. Today starts that sequence. 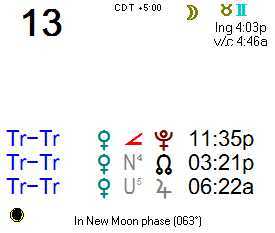 This Mystic Rectangle, and the entry of Venus into Pisces, marks the beginning of an important period of change. Some people will be big winners, others will likely be losers.